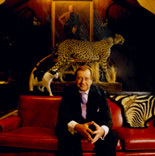 Tomicki at ease at The Explorer’s Club, New York…he travels with his pet cat, his own wines and a doddering retainer, only staying at the world’s best hotels. Tomicki not only has his suits made in London, his shirts and shoes are made there, too. DECONSTRUCTING A COMPLEX WILLIAM TOMICKI…. It’s not many interviews that begin with the subject of your story signing off on the phone “OK, I’ll meet you in Kathmandu Thursday—center of town, I’ll be on a yak with my guide Sven,” but that was exactly what travel and food writer Bill Tomicki was saying as a doddering retainer ushered me into his library. I had traveled to tony Montecito, California to interview the man Gentleman’s Quarterly had called “a true renaissance patrician” to get his insights into luxury travel and dining. Tomicki has climbed mountains and danced with head hunters. But he is not all about danger: he is a sensitive published poet and prize-winning photographer. And he has authored four books. What I saw was an intelligent, gentleman with wonderful manners (he also has a charming ability to thumb his nose at etiquette) and a deep knowledge of the world. His library was covered ceiling to floor with Old Master paintings and rare sculptures filled the room. The atmosphere was like an English club and Tomicki should know: he is a member of seven exclusive private clubs around the world. Tomicki leaned back, took a sip of wine and politely answered my questions with extreme patience. I was intimidated to say the least. In front of me was someone who had served in the Air Force during the Vietnam War and also knighted in France and in Portugal as a knight of the realm. He knows the world and what he speaks about. At the tender age of 21 Tomicki was already a legend in extreme travel and elected to membership in the prestigious Explorer’s Club in New York for his seminal work on voodoo in Haiti. Tomicki prefers luxury to roughing it, travels with his own wines and knows most power players in the industry from chefs to hoteliers to travel agents and guides. He is a darling of p.r. people and tries to work with them to achieve their goals, but never at the expense of the truth. One of his claims to fame is his monthly newsletter, ENTREE, an arch and insightful monthly advisory on restaurants, hotels, cruises, spa, books, wines and anything that happens to appeal to him. Although small by commercial standards, (ENTREE has 12,000 paid upscale subscribers and elite distribution with placement in the rooms of some very fine hotels, among them the Bel-Air, The Pierre and the St. Regis), he is one of the most respected men in the travel industry. The result of his impact is a passionate following who trust and follow Tomicki’s advice faithfully. 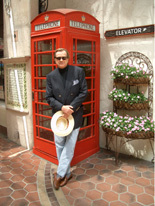 Tomicki is also Senior Editor of Traveler Overseas Magazine, a sumptuous color monthly, Travel and Restaurant Editor of the American-International News Syndicate, a columnist for the Bel-Air Hotel Magazine and a contributor to the Zagat Survey for Los Angeles and Santa Barbara. As a connoisseur of luxury travel, Bill Tomicki has provided insider advice to a discerning readership for 27 years. After becoming the youngest Vice President in the history of Tiffany & Co. in New York and then made VP of Sotheby’s before he was 30, Tomicki retired at 39 after developing real estate in Flordia, most notably the prestigious resort community of John’s Island in Vero Beach. The facts show Tomicki was a huge success financially as a businessman at a very early age. He then sought to put his connections and know-how to work and the result was a second career as a writer and publisher. To peruse his subscription-based travel newsletter ENTREE is to be whisked on a worldwide jaunt through five-star hotels, first-class restaurants and exotic locales. Written with considerable flair, an issue of ENTREE will tell you where to find luxe lodgings in Ethiopia, why to avoid the mega-resorts of Dubai and which spots in Ritz-Carlton’s global chain are the real turtle soup and which are the mock. To see Tomicki travel I am told is to behold the way he anticipates the needs of his well-heeled readers. As etiquette-minded as Emily Post one minute, he can turn as charmingly rakish as Errol Flynn the next requesting "a bottle of your finest champagne and a glass of your cheapest white wine" before asking the befuddled busboy if he'd like to dance. Always up for adventure, Tomicki is the embodiment of traveler as debonair swashbuckler. He is also the only travel writer I have ever met who has been nominated for a Nobel Prize in literature. In 2007 Tomicki acquired land in Devon, England along which came the title Lord Millcombe. He does not use the title but is hoping it will secure him a better table at Annabel’s some day. I asked him in terms of luxury travel, do you see more people seeking comfort or adventure? Any advice on how a traveler can find a marriage of the two? ”What are your thoughts on personal tour guides when visiting exotic lands and how can one go about finding a good one? ”What's one place you've never been but have always wanted to? “A staff that remembers you and cares enough to deliver what you like and need. The Milestone in London always puts Red Burgundy and Brazilian jazz in my suite there because they know I like both. Secondly, a quality bar. Like the one at The Lanesborough. Thirdly, gentlemen and ladies working there. The Cipriani has that. Comfortable beds. The Four Seasons George V in Paris is an example of a place with fine beds….and masses of extravagant fresh flowers. An excellent in-house restaurant. The Taj in Mumbai has several. Great art and furniture like the Ritz in Paris. Fine gardens like the Park Hyatt in Buenos Aires. A special car and driver for guests.” (Tomicki himself owns a dark green vintage Bentley that used to belong to Princess Grace of Monaco). And so, I leave this charismatic man, a true bon vivant and raconteur to say the least…he offers a bottle of wine from his 3000-bottle cellar I agree to taste it with him. The butler brings smoked salmon from Tomicki’s Shetland Islands company. All is right with the world. After all, I have heard this is a gentleman who opens a $2000 bottle easily for any guest…he is an extraordinary character, one we should celebrate and encourage. Santa Barbara, CA 93150, complete the on-line Subscribe Now form or email ENTREE. Travel Editor, El Paso Inc.